As with so many churches All Saints’, Tudeley would not be able to operate without the army of volunteers who keep the church on the road. On Sunday 2nd February the congregation of Tudeley and Five Oak Green said a big thank you to Patricia Dunkin Wedd who has for many years enabled Tudeley to give warm hospitality to the many thousands of visitors from all over the world who visit the Chagall stained glass windows. Patricia has been responsible as the Visitor Co-ordinator and has give countless talks to a wide variety of groups, including a large number of church groups, groups from Jewish organizations, school and art groups as well as many coach parties from home and abroad. The job of booking and liaising with these groups and individuals and organizing other volunteers to speak, as well as the hiring of the church and hall, has fallen to Patricia. She has given a huge amount of time and she now feels that it is time to step back and concentrate on giving talks. In addition to introducing visitors to the spiritual message of the windows, donations given by them help support both the work of the church more widely as well as the Chagall Window Preservation Trust. At her presentation she was given membership to the Friends of the Royal Academy so that she can enjoy more art. 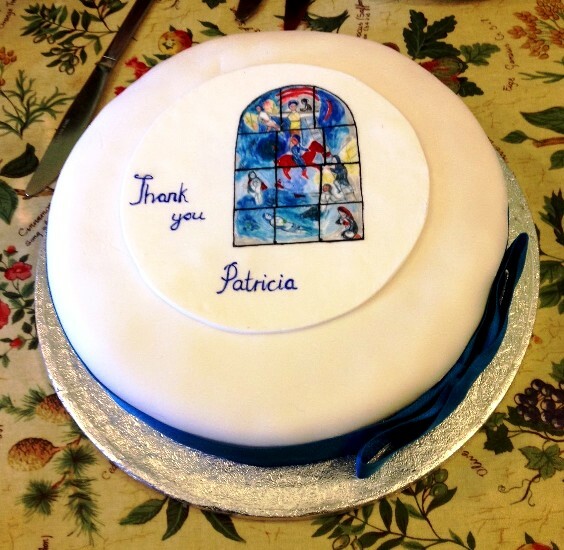 Patricia Gregory, one of the Church Wardens, had prepared a cake with a painting of the East Window. Patricia Gregory also is instrumental in a ministry of hospitality and with a band of helpers, offers refreshments to visiting groups. The money which Patricia raised through refreshments last year was just short of £1000, half of which went towards the Roof Fund for All Saints’, and the other half to charities which Patricia supports.